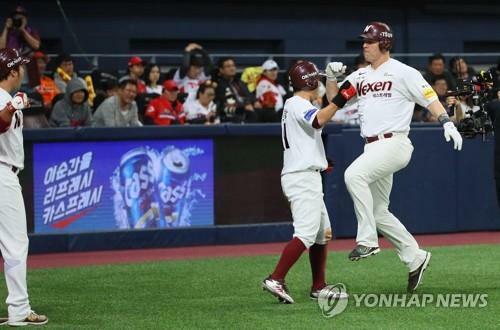 SEOUL, Oct. 16 (Yonhap) — The Nexen Heroes won South Korean baseball’s wild card game at home on Tuesday, knocking off the defending champions Kia Tigers 10-6 in an action-packed showdown. The Heroes pounded out 11 hits at Gocheok Sky Dome in Seoul and capitalized on four errors by their opponents to reach the next stage in the Korea Baseball Organization (KBO) postseason. Next up: the Hanwha Eagles, who advanced to the first round by finishing third in the regular season. The Eagles will host Game 1 of that best-of-five series at 6:30 p.m. Friday at Hanwha Life Eagles Park in Daejeon, 160 kilometers south of Seoul. No. 3 hitter Jerry Sands keyed a late rally with a two-run homer and drove in four runs for the Heroes, who also got three hits and an RBI from hard-hitting shortstop Kim Ha-seong. The Tigers wasted a two-homer day by Lee Beom-ho, and were sent packing a year after winning the Korean Series. As the fourth-seed, the Heroes needed either a win or a tie to move on, while the fifth-seed Tigers needed to beat the Heroes in two straight games to advance. The Heroes took care of business in one game. No fifth-place team has survived the wild card game since its introduction in 2015. The Tigers broke the scoreless deadlock in the top of the fifth, thanks to a two-out, two-run single by cleanup Choi Hyoung-woo. Starter Jake Brigham issued a leadoff walk and then hit Kim Sun-bin in the right hand on a bunt attempt. Roger Bernadina bunted the runners over. And two batters later, Choi battled Brigham to a full count before lining a single to left field and driving in both runners. Kim, an All-Star shortstop, was lifted from the game with bruised right pinkie, and his absence ended up having a major impact on the outcome of the game. The Heroes erased the deficit with five runs in the bottom fifth, a bizarre and chaotic frame that featured a catcher interference, a dropped pop fly, a wild pitch and a costly throwing error by Kim’s replacement, postseason rookie Hwang Yun-ho. Lim Byeong-wuk led off the inning with a single, and Kim Hye-seong reached first with a catcher interference call, after his bat clipped catcher Kim Min-sik’s mitt on a swing. Kim Jae-hyun hit an infield single to Hwang to load the bases, setting the stage for a wild sequence. Lee Jung-hoo popped the ball up over the infield, toward the third base line. An infield fly rule was in effect, but catcher Kim Min-sik and third baseman Lee Beom-ho let the ball drop in fair territory, and Kim only caught it after it crossed over into the foul ground. The play was ruled foul. Given a new life, Lee hit a sacrifice fly to left field, cutting the deficit to 2-1. After a wild pitch moved the runners to second and third, Seo Geon-chang hit a chopper to shortstop Hwang. It looked to be a routine play, but Hwang bobbled the ball and airmailed his throw over first base, allowing the tying run to come home. That runner from third, Kim Hye-seong, nearly tripped himself up on his way home, and Hwang would have had a play if he had gone home with the throw. That run chased starter Yang Hyeon-jong from the game, and the next pitcher, Lim Chang-yong, gave up a go-ahead, two-run double to Jerry Sands. Hwang was in the middle of this play, too. He made a diving attempt on the ball but instead it caromed off his glove and trickled into left field. Later in the inning, Kim Ha-seong dumped one into shallow center, just out of reach of sliding center fielder Bernadina, and Sands came home for a 5-2 Heroes lead. Three errors by the Tigers in the fifth tied the KBO postseason record for most in one inning. But the Tigers looked just fine at the plate, as Lee Beom-ho’s two-run bomb over left center cut the deficit to 5-4 in the sixth. The Heroes sent out a new pitcher, Han Hyun-hee, to start the seventh, and Bernadina greeted him with a ringing double to right field. Na Ji-wan, the next batter, drove him home to make it 5-5 with a single. Han was lifted without recording an out. Some outstanding defense by the Heroes kept the game tied in that inning. Choi Hyoung-woo sent a towering fly ball to deep left center for what looked to be a certain extra-base hit. But speedy left fielder Lee Jung-hoo made a spectacular sliding grab, catching the ball just before it hit the warning track while lying on his back. Na, who made a turn at second base and took a few steps toward third, was easily doubled up. Lee did even more damage at the plate in the bottom seventh. He led off that frame with a single off Pat Dean, the Tigers’ third pitcher, and sprinted home for a go-ahead run on Seo’s double. Kim Yun-dong took over for Dean, and Jerry Sands jumped on a first-pitch fastball from the right-hander and smacked a line drive homer over the left field for an 8-5 lead. 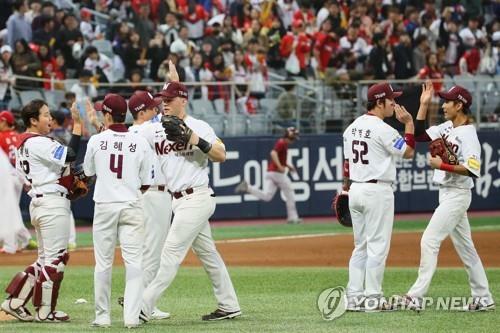 Following Kim Ha-seong’s one-out double, Lim Byeong-wuk delivered a knockout punch with a triple past diving Bernadina in center field, putting the Heroes ahead 9-5. Lee Beom-ho blasted his second home run of the game for the Tigers in the eighth, a solo shot cut the Heroes’ lead to 9-6. But the Tigers gave a run back in the bottom eighth. An error and two walks loaded the bases for Park Byung-ho, who hit a sacrifice fly to right to round out the scoring. Neither starter factored into the decision. Brigham was charged with four earned runs on five hits and two walks in six innings. In his first start since Oct. 3 following right oblique injury, Yang gave up four runs in 4 1/3 innings, none of them earned. Yang allowed three hits, but three pitchers that followed were touched for eight hits. Lee Bo-geun, the Heroes’ third pitcher, was credited with the win after giving up one run in two innings. Dean took the loss after allowing two runs in one inning. 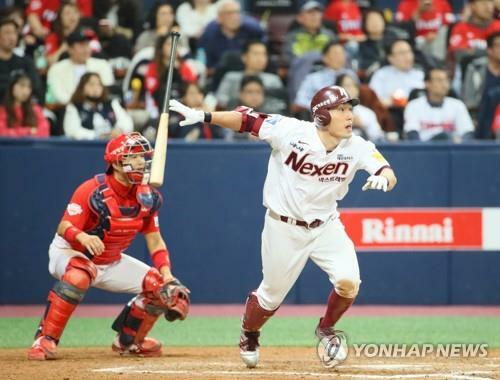 Nexen manager Jang Jung-suk said the fifth-inning comeback took his club over the top.